LumenX Ez Grip Bike Light consists of a front bike light and a rear tail light which can fit and easily attach to any bike – mountain bike, street bike or children’s bike. It has a high quality silicone material and a water resistant property which makes it great for safety and emergencies. LumenX offers the new high quality dual energy efficient LED bike light which are super bright, with 90 lumens and provide up to 150M safe use. For added safety, it has 1 red LED for the rear light and 1 white LED front light. It can be used in Four modes: Constant, Strobe, Disco strobe, Epileptic Fit Strobe. 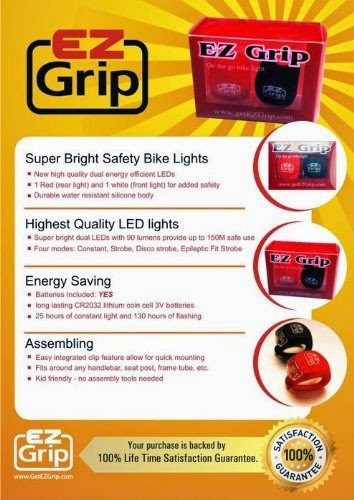 The Ez Grip Bike Light has an energy saving feature which can last up to 130 hours of flashing and 25 hours of constant light. It also has an easy integrated clip feature which allows quick mounting and fits around any handlebar, seat post and frame tube. Guaranteed to have the best LEDs which offers the best performance bike light at a minimal cost. We are dedicated to maintain our high quality standards in compliance with ANAI (American National Standards Institute), an industry standard for flashlight categories. As soon as I opened the box, my oldest son wanted to put them on his bike. He has absolutely loved having these lights on his bike. They're easy to use and very easy to install. Both the red and clear LEDs are very bright and easily seen in the dark. Just like any other LED, these will blind you! It was like I'd looked at a camera flash. But I suppose that's the whole point. I would certainly recommend these to anyone. These lights are especially great for kids. I'd even go so far as to say these would be ideal for walking in the dark, at least on steady-on mode.